Summary of today’s show: Scot and Fr. Chris read two very different addresses from Pope Benedict XVI in his visit to Germany last week, to the Parliament and to young people. To Parliament he called them to remember that the root of law is a respect for human rights and dignity born out of the natural law. To young people, he called them to live as saints, joy-filled and reflecting the light of Christ; not dour, boring, and naïve caricatures of unhappy and unsmiling and far apart from us. 1st segment: Scot and Fr. Chris talked about the ailing Red Sox and whether more prayers in New England are going up to God for them. They also discussed how the seminarians at St. John Seminary get involved in sports. Fr. Chris said they have formed four intramural teams and will compete for the Rector’s Bowl. He said it’s important because exercise clears our heads and helps us to think and pray better. It’s also good competitive spirit and fosters community. In October, they also have a softball tournament versus the seminarians at Blessed John XXIII Seminary, who the St. John’s seminarians affectionately call the Relics. There was also recently the Family Day at St. John’s. Fr. Chris celebrated the Mass and saw how prayer works. Seven or eight years ago there were just 28 men and today there are more than 80. At this family day, the refectory was filled with family of all kinds. Scot said most priests describe their family experience as their first seminary, which makes it so difficult for the men whose parents aren’t supportive of their vocation. 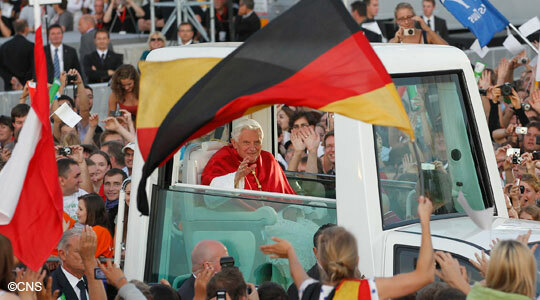 Scot said Pope Benedict went home to his native Germany over the past half-week. He’s been writing for years about the crises of Europe losing its Christian roots. Scot thinks it’s a highlight for the Pope to be able to go to his homeland and address these issues. Fr. Chris said Pope Benedict carried important messages back with him. Scot noted that Pope John Paul’s first return to Poland after his election was described as nine days that changed the world. Perhaps this is Pope Benedict’s five days that changed Europe. 2nd segment: Scot said the Pope’s most significant address in Germany was reflections on law to the German Parliament. Scot said he was pushing back against any kind of secularism that tries to minimize the importance or place of faith in society. At this moment I turn to you, distinguished ladies and gentlemen, not least as your fellow-countryman who for all his life has been conscious of close links to his origins, and has followed the affairs of his native Germany with keen interest. But the invitation to give this address was extended to me as Pope, as the Bishop of Rome, who bears the highest responsibility for Catholic Christianity. Fr. Chris said the Pope made clear that he is coming as the Vicar of Christ, St. Peter’s successor, and he had something to share with the leaders of this powerful nation. Scot said Americans can imagine the Pope standing in the well of the House in Congress addressing the same audience as the State of the Union. In the First Book of the Kings, it is recounted that God invited the young King Solomon, on his accession to the throne, to make a request. What will the young ruler ask for at this important moment? Success – wealth – long life – destruction of his enemies? He chooses none of these things. Instead, he asks for a listening heart so that he may govern God’s people, and discern between good and evil (cf. 1 Kg 3:9). Through this story, the Bible wants to tell us what should ultimately matter for a politician. His fundamental criterion and the motivation for his work as a politician must not be success, and certainly not material gain. Politics must be a striving for justice, and hence it has to establish the fundamental preconditions for peace. Naturally a politician will seek success, without which he would have no opportunity for effective political action at all. Yet success is subordinated to the criterion of justice, to the will to do what is right, and to the understanding of what is right. Success can also be seductive and thus can open up the path towards the falsification of what is right, towards the destruction of justice. “Without justice – what else is the State but a great band of robbers?”, as Saint Augustine once said. We Germans know from our own experience that these words are no empty spectre. We have seen how power became divorced from right, how power opposed right and crushed it, so that the State became an instrument for destroying right – a highly organized band of robbers, capable of threatening the whole world and driving it to the edge of the abyss. To serve right and to fight against the dominion of wrong is and remains the fundamental task of the politician. At a moment in history when man has acquired previously inconceivable power, this task takes on a particular urgency. Man can destroy the world. He can manipulate himself. He can, so to speak, make human beings and he can deny them their humanity. How do we recognize what is right? How can we discern between good and evil, between what is truly right and what may appear right? Even now, Solomon’s request remains the decisive issue facing politicians and politics today. How do we determine what is right from what appears right? What is the foundation of law? Fr. Chris said you can see where Pope Benedict is going already. There are three major arguments in philosophy: Truth vs. opinion, nature vs. convention, appearance vs. reality. Those are the arguments Pope Benedict is setting up here. Scot also noted that the Holy Father references the evil of the Nazis that Germans remain very aware of. He also said so clearly: Man can destroy the world and manipulate humanity. Fr. Chris said Pope Benedict is making clear to politicians that their role is not to do what is expedient or popular but to do the common good by upholding the dignity of every human person. For most laws, the sense of the majority is a fine basis for what makes a good law. But on the fundamental issues of life and the dignity of the human person, majority rule is not sufficient. Fr. Chris said the truth must prevail, even if everyone is doing something other than the truth. Pope John Paul II in his encyclical Fides et Ratio makes it clear that truth is not built on consensus. Every person has a conscience and if it’s properly formed and working, then it can lead us to the truth. Scot said our Declaration of Independence affirms that we have inalienable rights that come from God, not the state. How do we recognize what is right? In history, systems of law have almost always been based on religion: decisions regarding what was to be lawful among men were taken with reference to the divinity. Unlike other great religions, Christianity has never proposed a revealed law to the State and to society, that is to say a juridical order derived from revelation. Scot said the Pope is comparing it to Sharia law in Muslim societies, where civil law is religious law. Christianity has never proposed that. Fr. Chris said Christianity proclaims the truth and leaves the creation of laws to politicians. Instead, it has pointed to nature and reason as the true sources of law (common sense) – and to the harmony of objective and subjective reason, which naturally presupposes that both spheres are rooted in the creative reason of God. Christian theologians thereby aligned themselves with a philosophical and juridical movement that began to take shape in the second century B.C. In the first half of that century, the social natural law developed by the Stoic philosophers came into contact with leading teachers of Roman Law. Through this encounter, the juridical culture of the West was born, which was and is of key significance for the juridical culture of mankind. This pre-Christian marriage between law and philosophy opened up the path that led via the Christian Middle Ages and the juridical developments of the Age of Enlightenment all the way to the Declaration of Human Rights and to our German Basic Law of 1949, with which our nation committed itself to “inviolable and inalienable human rights as the foundation of every human community, and of peace and justice in the world”. Fr. Chris said he is making clear that law has to involve reason and has to be explained to people in ways they can understand. If it’s not explainable to people or violating the common good, it creates chaos and tension within the community. Scot said advocacy of human rights doesn’t just have its basis in Christian theology, but in natural law which predates the Church. 3rd segment: Scot said Pope Benedict is so forceful on this issue, not just because he thinks it undermines Christianity, but that it will also destroy society as a whole. The idea of natural law is today viewed as a specifically Catholic doctrine, not worth bringing into the discussion in a non-Catholic environment, so that one feels almost ashamed even to mention the term. Scot said for almost two millennia, when the Church taught something that came through common sense and the natural law, it was never seen as specifically Catholic. Now secularists claim that any reference to natural law is code for Christianity. Pope Benedict is drawing a clear distinction. Fr. Chris said so many people tell us to leave our faith at the door to the public square, but Pope Benedict says natural law is beyond religion. Scot said natural is based on “nature”. Scot gave the example that saying traditional nuclear families are ideal for raising children is natural law, not Christian theology. Let me outline briefly how this situation arose. Fundamentally it is because of the idea that an unbridgeable gulf exists between “is” and “ought”. An “ought” can never follow from an “is”, because the two are situated on completely different planes. Scot said “is” is how things are and “ought” is how things should be. Fr. Chris said what is (truth) versus how man takes it (convention). Scot said the “ought” is what are our values and where do we want to go as a society. When there is no objective values to build on, how can any decision stand? There are always belief systems in place in the public square and today it’s often atheism that’s antagonistic toward any theistic belief system. Fr. Chris said Cardinal Seán recently said in the early Church we fought over big theological ideas. Today we find ourselves battling against ideas over what it means to be human and what it means to be free. The Holy Father talks about positivism, a philosophy that says we don’t need God, but that man will always be better and do good. [T]he positivist understanding of nature has come to be almost universally accepted. If nature – in the words of Hans Kelsen – is viewed as “an aggregate of objective data linked together in terms of cause and effect”, then indeed no ethical indication of any kind can be derived from it. Fr. Chris said this way of thinking claims that people do bad things because they are hardwired for it and we just need to find the right chemical to fix it. A positivist conception of nature as purely functional, as the natural sciences consider it to be, is incapable of producing any bridge to ethics and law, but once again yields only functional answers. The same also applies to reason, according to the positivist understanding that is widely held to be the only genuinely scientific one. Anything that is not verifiable or falsifiable, according to this understanding, does not belong to the realm of reason strictly understood. Hence ethics and religion must be assigned to the subjective field, and they remain extraneous to the realm of reason in the strict sense of the word. Where positivist reason dominates the field to the exclusion of all else – and that is broadly the case in our public mindset – then the classical sources of knowledge for ethics and law are excluded. This is a dramatic situation which affects everyone, and on which a public debate is necessary. Indeed, an essential goal of this address is to issue an urgent invitation to launch one. Scot said the Holy Father seeing the roots of how thinking develops over time, the foundations of what makes us what we are will undergo fundamental deterioration if we don’t discuss how reason goes into making good law in these democracies. Fr. Chris noted that it was Nietzche’s philosophy of the Super Man that influenced Hitler to launch the Third Reich. Marxism and Nietzchism are positivist philosophies that see Christianity and all religion as the enemy. Positivists say to live now in this life because their is no afterlife. He has called Europe to defend those criteria. The idea that God created us gave rise to the concept of human rights and inviolable dignity before the law. Fr. Chris said we live in positivism where we go along and forget where we came from, the principles that formed our nation-states. He’s saying Don’t forget your roots, who made you, and where you come from. Pope John Paul in Fides et Ratio said, Reason and faith are the two lungs of one body and both are essential to every human person, because both have come from God. Scot said the Church doesn’t tell us just to blindly accept teaching, but to internalize it and think it through, asking God’s help so we can embrace the teaching because it’s true, not just because someone in authority says so. Fr. Chris said our faith can withstand any approach of reason. It’s a natural part of reason to come to understanding. 4th segment: Scot said Pope Benedict’s address to the youth has garnered the most attention in the Catholic world. Scot said this address is extremely down to earth in comparison. It’s a wonderful, warm address that we’re all called to be saints and tells us how to live holiness by letting Christ shine through and joy-filled, in the world and connected, not boring and naïve. Fr. Chris said he captures sanctity. We’re called to be saints, which means to enjoy the beatific vision in heaven with God our Father. Every saint has a past and every sinner a future. Pope Benedict reminds us of the great mercy of Christ. Scot said many modern saints, including those might be canonized at some point, in their biographies you see them desire to tell the whole story, warts and all, to show how often they turned back to the mercy of God. The saint knows they don’t fall less than others; they just recognize that God picks them up each time. Fr. Chris recalls in the biography of St. Therese of Lisieux how there was a sister in the convent who drove her crazy, but she showed so much love to the nun that she believed that Therese loved her best. Saints are called to take the hand of the Lord, cling to it and walk as He does. Scot said Pope Benedict would say the same to all of us: Dare to be saints. Fr. Chris said don’t be afraid to make sacrifices and renunciations. We can never outdo God in his generosity, love and goodness. All He asks is that we live in him and follow him. Scot said the crisis of faith in the Church is because we don’t have enough saints, average everyday person who turns to God each day asks to be his vessel. With just a few saints in Boston we would change the perception of the Church in society. Scot noted how so many people at the Celebration of the Priesthood last week said that priests’ holiness have inspired them to live a deeper faith.